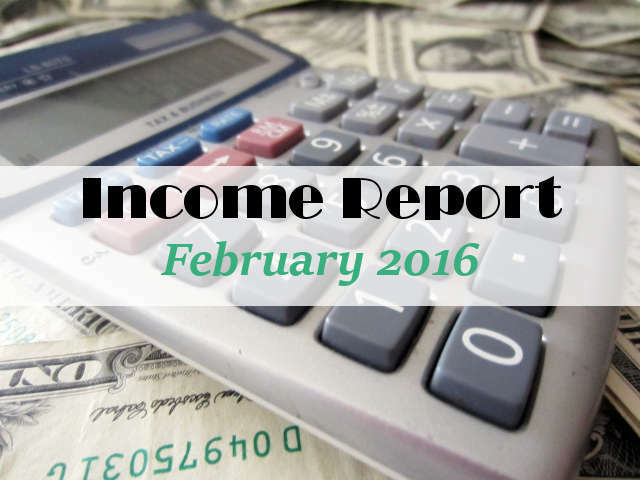 Welcome to our February 2016 Income Report. Between our web business and real-life, 2016 has been a busy year so far. Last month we were skeptical that we’d be able to reach our $2000 goal for this month. I’m happy to report we were wrong yet again and posted our best month ever. But it wasn’t without it’s ups and downs …..
We reported last month that we were switching our main money site over to a new affiliate program that was more focused plus paid a lot better. We are happy to report that that transition went pretty smoothly though it was a lot of work to put into place. Sales are clipping along at a pretty good pace, and with the new commission rate being so much higher than what we were previously receiving, it helped move February along even though we didn’t end up transitioning over until the 10th of the month. Now for the downs. Our other money sites have not fared nearly as well recently, and this site is no exception. While I don’t have the exact figure at hand, our main money site is bringing in a far higher percentage of our total revenue than ever before. Diversifying our income over multiple sites is what our end goal is (along with making money). We’ll be working on getting our other sites back up to speed in the short term to even things out a bit better. We had a frustrating experience with one of our money sites that typically averages us about $350/month in revenue. Sales had dropped off dramatically over the past month but we just put it off to Google doing what Google does and didn’t pay too much attention. Turns out that was a big mistake. We had a software glitch with a caching program that we removed early last month and it turned out that all our normal traffic was seeing a cached site from 3 months ago. We didn’t notice because any visits we did to the site we were logged in as administrator and it showed without the cached pages. We just figured this all out this morning, it was a frustrating six hours to figure out the problem and likely several hundred dollars lost in revenue because of it. Lesson learnt. Last month we stated that we wouldn’t likely see the same traffic volume this month that we did in January. We were mostly wrong again. Sure is nice being wrong in the right way! As you will see from the chart, while our total users was down slightly, the actual users per day was up just a tiny bit due to the shorter month (1510/day: January, 1521/day: February). But what is really nice to see is that our pageviews increased from 1.99 per user to 2.2 per user. In big part, this increase is due to the work we’ve done to optimize the sites. A nice trend upwards for sure. Hate sounding like a broken record, but I am predicting flat or slightly lower traffic for March. Can’t go up forever. In January I said that I doubted we’d hit the $2000 mark in February and here we are with a new record month! The increase in sales is due almost exclusively to changing our main money site over to the new affiliate program. This site (moms-make-money.com) made a bit more money this month but was still just around 2% of our revenue. I am so happy that we are well on our way already to our 2017 goal of $4000/month. If all goes as planned, we will be over $3000 for March 2016 and hopefully close to around $3500. Early retirement is looking like it may just be possible! As a reminder – RPM stands for Revenue Per Mille, meaning revenue per 1000 pageviews. It’s one of the metrics used to gauge how well sites are doing. I know last month I said we may not continue with this graph but I was so pleased with our figures that I thought I’d show it off. The increase this month is in large part due to our main money site changes but also to how we spent so much time optimizing our sites for better conversions. The moral of the story is, don’t sit back and let things go – keep improving your properties. There is no such thing as a site that is 100% hands off. Lots of people will tell you that and it is simply not true. If you don’t spend at least a little time figuring out how to make things better on your site(s), then you will – guaranteed – see your revenue slowly start to fall off. Some sites take way less time than others, but all of them need some TLC from time to time. We’ve broken down where our revenue comes from as best we can. We can’t be happier with our sales so far this year. One thing we are slowly learning in the internet business is that you often won’t see any payback for work you do for many months down the road. It can be frustrating and even demoralizing spending countless hours on your site with no way of knowing if there will be a return in the end for your efforts. All we can say to that is to keep your chin up, work as much as you feel you can and do the absolute best you can and the spoils will eventually follow. We have gone from zero to almost $3000 per month in income in our spare time in just over a year, so if we can do it so can you!